How to become a guest..
You My Next Interview Guest? I am always on the lookout for dynamic individuals who want to share their knowledge with our listeners. 3) Prior to the call I'll have questions prepared. The call will be recorded and edited. 5) The most important point - Be prepared to have fun and share your expertise. embedded audio and links which will also be sent to you for final approval. I have interviewed hundreds of experts from across the glob. folks in the trenches building their businesses. Won't you be a part of the world’s leading free digital audio business library? Need more proof that these your audio interviews can truly impact the lives of others? go here. http://www.hardtofindseminars.com is billed as the world's best free marketing resource on the internet. 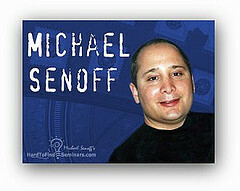 Michael Senoff's http://www.hardtofindseminars.com site is truly awe inspiring! In the click of your mouse button you are launched into a new, parallel universe of the wealthy and famous. Genuine success story after genuine success story are there in full downloadable audio interviews. These recordings are not just testimonials - They're step by step detailed blueprints for your very own success. Michael Senoff’s http://www.hardtofindseminars.com is the essential, one and only, tried and tested gateway to your new future. Packed with amazing links & over 117 hours of downloadable business audio interviews, hints and marketing tips, which can make you seriously wealthy. It's not just a must have site about wealth and its creation. It's the only site. So, if you want to know how, without the risk, then this is the only guaranteed free marketing seminar site for you. I'm not easily impressed, this impressed me, and still does. Go to Michael Senoff’s http://www.hardtofindseminars.com before he starts charging huge fees for this information that he could easily charge thousands for.